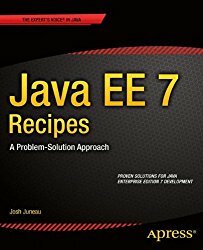 Java EE 7 Recipes takes an example-based approach in showing how to program Enterprise Java applications in many different scenarios. Be it a small-business web application, or an enterprise database application, Java EE 7 Recipes provides effective and proven solutions to accomplish just about any task that you may encounter. You can feel confident using the reliable solutions that are demonstrated in this book in your personal or corporate environment. The solutions in Java EE 7 Recipes are built using the most current Java Enterprise specifications, including EJB 3.2, JSF 2.2, Expression Language 3.0, Servlet 3.1, and JMS 2.0. While older technologies and frameworks exist, it is important to be forward-looking and take advantage of all that the latest technologies offer. Rejuvenate your Java expertise to use the freshest capabilities, or perhaps learn Java Enterprise development for the first time and discover one of the most widely used and most powerful platforms available for application development today. Let Java EE 7 Recipes show you the way by showing how to build streamlined and reliable applications much faster and easier than ever before by making effective use of the latest frameworks and features on offer in the Java EE 7 release. Shows off the most current Java Enterprise Edition technologies. Provides solutions to creating sophisticated user interfaces. Demonstrates proven solutions for effective database access.